As the headlines in the image below suggest, Gerard Minack has developed a reputation for his bearish views. So to hear that he has turned bullish on the outlook for US growth certainly caught us off guard. For those not familiar with the man, Minack is widely regarded as one of Australia’s leading investment strategists. Following a stint at Morgan Stanley, where he built his reputation, Minack recently ventured out on his own - providing independent strategy advice to asset managers. It’s been 12 months since Minack provided one of his few public interviews via Business Spectator. The headline delivering his view that a Global Recession was on the cards within the next one to two years. At the core of Minack’s thesis was a view that global growth was stagnating and that Central Banks had little stimulatory tools at their disposal. Adding to his case was a view that the level of political dysfunction in The US and Europe was so dire, that the prospect of any coordinated fiscal response appeared as likely as Australia claiming the first test against India in Pune. So when reading Alan Kohler’s weekly missive via The Constant Investor, it caught me somewhat by surprise to see that Gerard has changed his tune when it comes to the global growth outlook and in particular for the US. 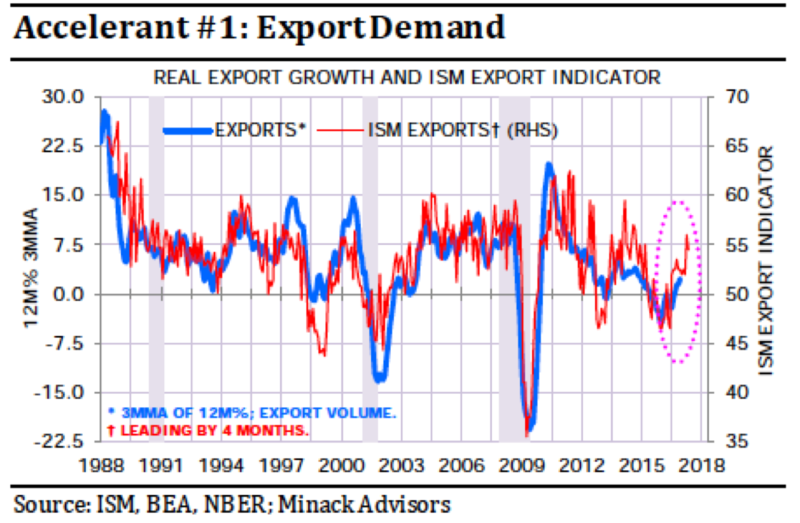 In a note titled US growth, already running above trend, seems set to accelerate, Minack points to stronger export growth and stronger business spending (charts) as leading indicators for a robust growth outlook in the US. 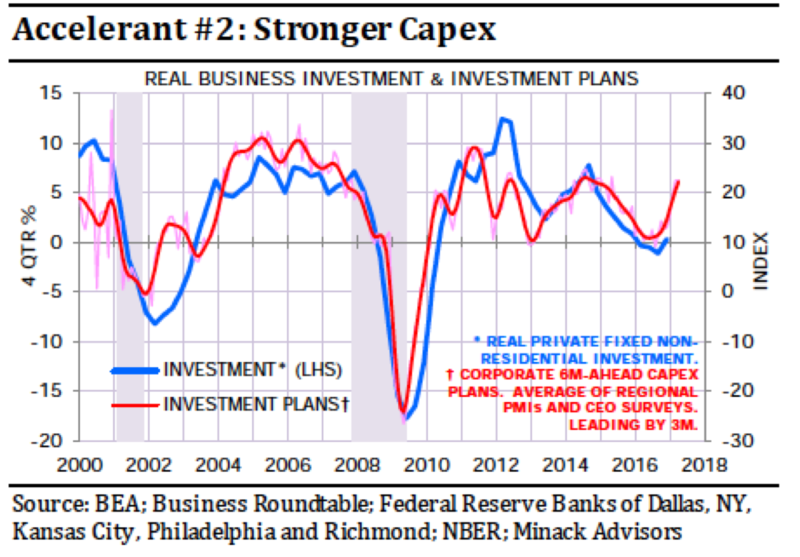 The take out is - when you factor in the prospect of increased fiscal stimulus and an economy already building a head of steam the case for rates to rise faster than markets anticipate gains some traction. And as Kohler points out, the fact that a self-proclaimed secular stagnationist (is that even a word?) is willing to change his position potentially adds credence to his argument. So while the prevailing economic backdrop against which Minack made his Global Recession forecast has not played out, the preconditions for tighter financial conditions look to be gathering momentum. Indeed, it is tighter financial conditions that Minack asserts will be the ultimate cause of an economic downturn. In his view this boils down, quite simply to US dollar strength. The conundrum facing Central Banks is that the current ultra low interest rate settings leaves few policy options to combat a global downturn - should one occur. The flip side is that a raging US economy could see financial conditions tighten faster than many anticipate. 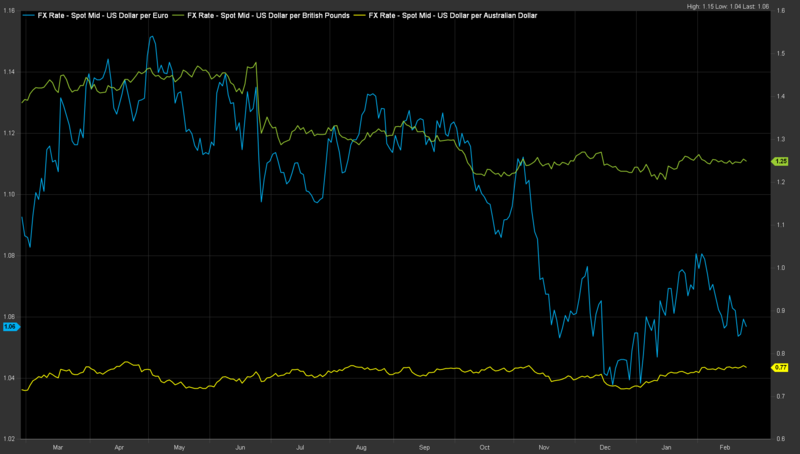 Interestingly, when you look at the USD on a one year view the picture is quite different (see chart below courtesy of FactSet). Either the USD is due another move higher and markets are yet to factor this in... Or the strong moves in the preceding few years were indeed the markets moving in anticipation of economic growth. And perhaps the USD has already run it's course? Minack's view may prove to be correct in this case, though I can't help but remember that his last big call, that 'Australia had run out of luck' and thus had a good chance of entering a recession before the end of 2015, turned out to be wide of the mark. Somewhat vague. Minack's current financial conditions have growth "set to accelerate" or to be the "ultimate cause of an economic downturn". The $US "is due another move higher" or "has already run its course". I've been reading the views of experts / economists / strategists etc for over 40 years and reckon they get it right about half of the time and miss most of the really major changes. May as well toss a coin. Hi Graeme, appreciate your feedback. There is nothing certain about forecasts, strategists like Gerard Minack work on probabilities not certainties and use economic data to help with their analysis. I found it interesting to see that Minack – a highly regarded strategist - had changed his view. His position was supported by the data, which was presented in the two charts I included. The data on the US dollar was used to illustrate how the market had moved given this was previously cited as an influential factor in the global economy. The comments you highlight regarding the US Dollar are mine not Minack’s. I have no idea where the US dollar goes, however, I was interested to see that given the strength of the US economic data that the USD had not moved against many major currencies over the past year.